In US stock exchanges there are almost 10.000 stocks and ETFs. From this plethora we must find 5-10 stocks that fulfil our trading criteria, in order to trade. Stock screeners or scanners are programs that take input from us (criteria) and show the stocks that fulfil our needs. So from the 10.000 stocks, at the end we will stay with 5-10 and by further technical analysis we will be left only with 1-3 to trade. Before someone starts screening he/she must have exactly in their mind what they are looking for in order to input the right criteria. The trading algorithms can provide a clear thought process before someone starts screening. Two of the best sites that provide free stock screeners for the US stock exchanges are www.freestockcharts.com and finviz.com. It is a great site with real time prices without delay. Its charts are fully customizable and with multiple time frames. Under the menu tab “Scans” it provides many criteria, fundamental and technical, that someone can use to pick the stocks they are interested in. Also a great site with clear charts (although not fully customizable without subscription) and a free detailed stock screener under the menu tab “Screener”. The market is in uptrend and we want to swing trade using breakout strategy. In order to find breakout patterns we can look for ascending triangles. First of all we must assure that the stock has sufficient liquidity (volume), so we will use the criterion of average volume above 1 million per day. Secondly we want to trade a stock with price less than $30 in order to manage risk better, relatively to our capital. Below is a depiction of the three criteria we inserted in the screener. 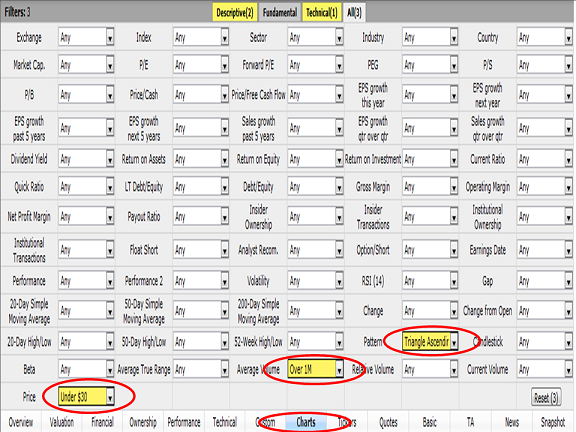 By pressing the tab “charts” in the red circle, we can have daily charts for all the stocks that fulfil the criteria.